BRIEFLY: Above New York and Philadelphia debris MAN MAN materializes, tender and nightmarish, fastening together Screaming Jay Hawkins, Etta James, 80's pop and Iggy Pop; drawing on Soda Popinski, Mexican funeral marches, religious cults, bad luck, and the pervasive mythology of two-headed wolves and wrangling out something entirely else: peculiarly brilliant, acrobatic, unsettling, romantic, unpretentiously ordered. Accompanied on one song by a chorus of kindergartners, MAN MAN multiplies precise instrumentation and refined song structure by unusual rhythms and a thick, complex texture to produce a polished eclecticism unlike anything in our collective musical consciousness. 2007-03-30 MAN MAN and MODEST MOUSE on tour together!! 2006-11-12 Annuals and Man Man Nominated by Plug Awards!!! 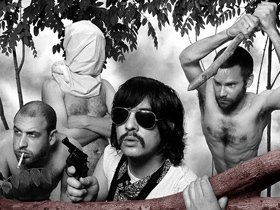 Man Man is not currently touring. Check the Tours Section for previous Man Man tours.